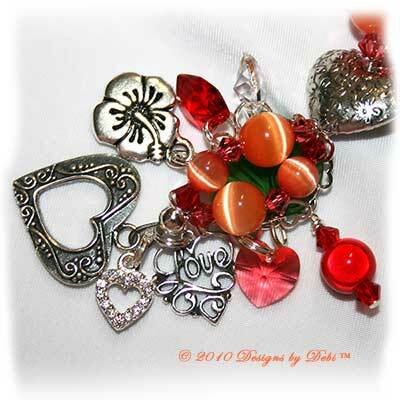 Valentine's Day is coming and this bracelet is centered around that theme. 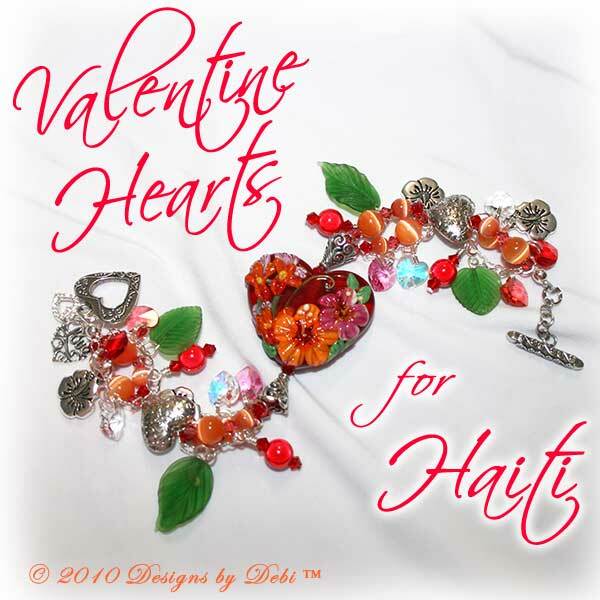 I designed this bracelet to raise money to help the people of Haiti. So, in addition to giving you the opportunity to adorn your wrist with twinkling hearts and beautiful flowers that will last forever, purchasing this one-of-a-kind bracelet will allow you to open your heart and make a difference for some people who really need it. I began this piece with an absolutely gorgeous artisan lampwork bead handmade by Susan Elliot of Doodletart Glass in Dunnellon, Florida. 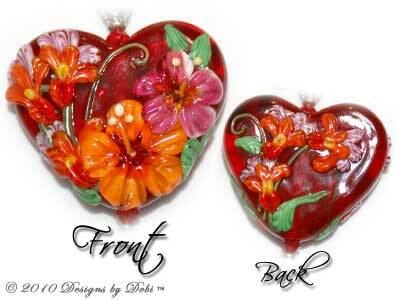 It is a red, heart-shaped bead with pink and orange hibiscus; red, yellow and lavender flowers and green leaves. 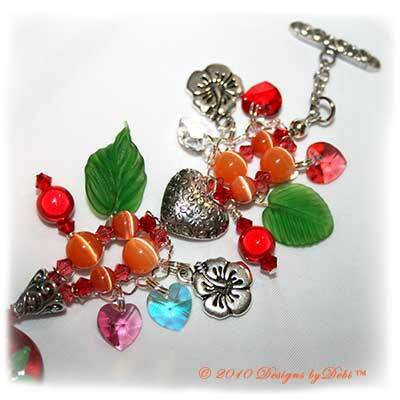 The hibiscus is my favorite flower and I am totally addicted to Susan's beautiful beads!! I'm sure you've heard about the magnitude 7.0 earthquake and many aftershocks that hit Haiti on January 12th leaving more than 200,000 dead and 1.5 million homeless. The news coverage, stories, photos and videos coming out of Haiti are absolutely heartbreaking. The people of Haiti need our help. Their needs are many and their recovery will be very long and very difficult. So the charity I've chosen for this month, to receive the donation from this piece, is one I have donated to myself; one that I feel can best get aid directly to the Haitian people who need it. It is Yele Haiti, a foundation founded by Grammy-Award winning musician and Goodwill Ambassador to Haiti, Wyclef Jean in 2005. Their mission is to build global awareness for Haiti and to change and improve the lives of the people of Haiti through their various projects. They make a difference by creating jobs, putting children in school, improving the quality of education, distributing food, mobilizing emergency relief and running health and community development programs. And as expected during this crisis, they are actively involved in earthqualke relief; Wyclef Jean himself has been to Haiti helping his people multiple times since the quake hit. To find out more about Yele Haiti or to make a donation on your own, go to www.yele.org. To purchase this bracelet and raise money for this very worthy cause, click on this link to my ArtFire Studio to purchase it from there or contact me if you wish to make other arrangements. Whether this is a treat for yourself or a gift for someone you love, I hope knowing the purchase funded a significant donation to the people of Haiti will make it even more special. 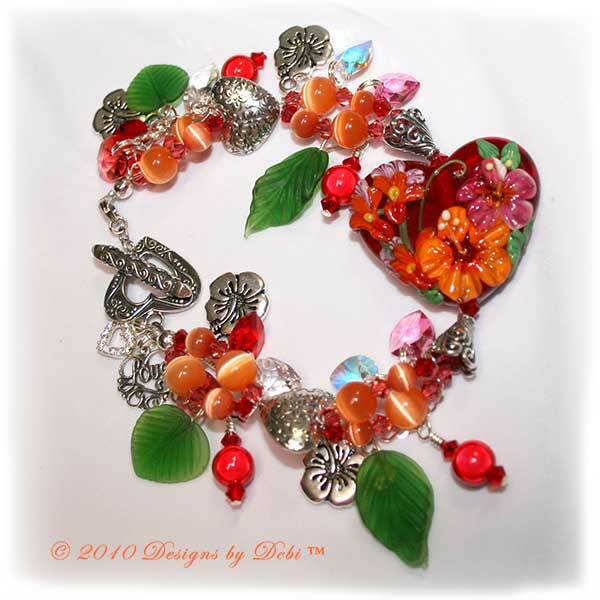 The bracelet measures 9 3/4 inches and will fit a 6 1/2 inch (very loosely) to 8 inch wrist. I purposely left extra links on one end so that it could quickly be adjusted to a wide variety of sizes; it can easily be shortened by 1/2 inch. 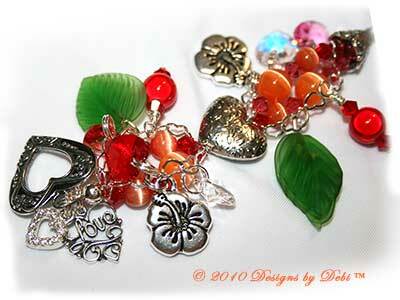 Any other resizing will be more involved and take a bit of time before the bracelet will be ready to ship. If you need the bracelet re-sized, please let me know at time of purchase and this can be done prior to shipment at no additional charge.